I’ve got to admit something right off the bat here: This was a very difficult album to review. This album has some very epic moments, but it also has some offensively poor moments as well. It is such a mixed bag, so I struggled to come up with a number that could rate it. The awesome artwork didn't help anything either because I tend to want to like albums with excellent cover art. 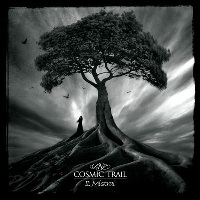 A Cosmic Trail is an instrumental band out of Germany that claims to tear down musical boundaries. They have a ton of influences ranging from jazz to folk music, and these certainly make it into the music. Their sophomore album “II: Mistral” is quite an effort, and it is definitely intriguing. Each and every track is quite different; but, as I said, this results in a mixed bag of sorts. “In Ertia”, for instance, has a haunting ambiance and some awesome high-tuned guitar work. It also has some folk influences that blend this track into something special. Yet, the short opener, “Calm”, is a waste of space as it is nothing more than a classic rock guitar solo that feels wildly out of place on the album. For another example, “Mistral I” and “Mistral II” are both excellent pieces that include some creative guitar work and wonderful drumming. Yet, “Thwart Progress” is a slightly pretentious piece of work that seems more like an impromptu jam than an actual song. However, "A Ghostly Whisper" is an excellent piece of ambient music. The music is generally proficiently performed: I was especially impressed with the guitar work, as this takes center stage most of the time. The band claims to tear down musical boundaries, but I really don’t get this as an overwhelming impression. Sure, there are some elements here and there, but the music is generally prog rock focused with some cool atmospheres and some wonderful flute thrown in randomly. All of it is well-done (I loved the flute), but it never really amounts to much. I think this album deserves a listen by fans of instrumental prog, but I don’t think anyone will be captivated by it. It’s an album I want to love, but there is just enough bad to bring down the good. Although, admittedly, the good outweighs the bad. Take that how you will.